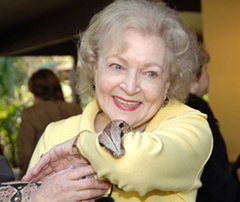 We Honor Betty White at the 40th Annual Beastly Ball! From her hilarious performance in the Snickers’ ad during this year’s Super Bowl to her recognition by the Screen Actors Guild for Lifetime Achievement, our beloved Betty White has been on quite a roll. At 88 years young, GLAZA Trustee Betty White, who has given more than 46 years of service to the Los Angeles Zoo, will be honored at this year’s Beastly Ball. For four decades the Beastly Ball has been one of Los Angeles' wildest, most wonderful fundraising events and a scintillating way to celebrate the arrival of summer. The 40th Annual Ball is scheduled for June 19, and the evening's program features all the elements Zoo supporters have come to know and love — fine fare, excellent entertainment, engaging animals. Named by the Los Angeles Times as one of the city's best gala events, the Ball will take place under a canopy of exotic botanicals and amid myriad exotic animals; this casual event always entertains, delights, and dazzles the senses. Take a walk on the wild side and join us at this year's Beastly Ball! Your participation will strengthen efforts to provide the Los Angeles community with one of the finest zoos in the world. Individual non-reserved tickets are $1,000 per person, with sponsorships ranging from $7,500 to $100,000. For more information on tickets and sponsorships, please call Maricela Vazquez at 323/644-4753.